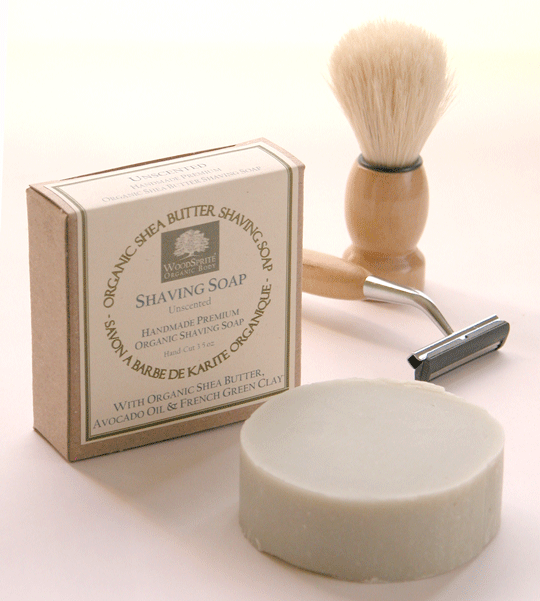 Our Unscented formula is perfect for sensitive skin, or for those preferring an unscented soap. Great for men or women! May be used by lathering with the tips of the fingers or in gentle circular patterns using a traditional mug & brush (Brush and Razor Not Included), or as a natural, gentle body soap. Ingredients: Saponified *Organic Extra Virgin Olive & *Organic Coconut Oils, *Organic Shea Butter, *Organic Castor & *Organic Avocado Oils; French Green Clay (montmorillonite), Bentonite Clay. (*Certified Organic) Handmade & Hand-Cut 3.5 oz, 3-inch diameter. I found your soap on a shaving forum and was not disappointed. I use this with a mug and brush and get a very clean shave that doesn't dry out my skin. Thanks for a great product.